Policemen were on Monday deployed to the Inland Containers limited (Bonded Terminal) along the Abdullahi Bayero road in Kano to prevent possible break down of law and order following a protest by truck drivers who brought containers. 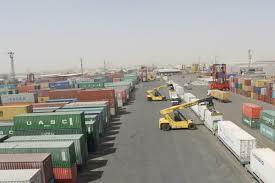 Reports say that the truck drivers who blocked all roads leading to the Terminal were protecting the failure of the Customs officials to clear the containers for over two months. The drivers accused the Nigerian Customs officials in charge of the Terminal for being insensitive to their plight as most of them had no money to even feed themselves. The truck drivers who lamented the situation, said they would not remove their vehicles on the roads until the authorities concerned come to their rescue. They called on the Federal and Kano State Government to intervene before the situation degenerated into a serious crisis between the drivers and customs officials. “Some of us have spent over two months while others have spent more than that waiting for the clearing agents and customs officials to clear the containers. “Unfortunately nothing is being done to clear the containers to enable us go back to our respective towns. The most painful thing is that majority of us have been exhausted as we have no money to feed ourselves, “one of the drivers told reporters. As at the time of filling this reports human and vehicular movement especially along all major roads leading to the Terminal had been stopped due to the blockage as socio-economic activities had been paralysed in the entire areas. When contacted, the Deputy Comptroller of Customs in charge of the Terminal, Mr Gadado M. M. said he was not allowed to talk to journalists. However, when contacted, the Public Relations Officer of the Kano/Jigawa Customs Area Command, Mr Danbaba Isah said the Nigeria Customs Service had no hand in the problem.